Richmond Law achieved its highest ranking ever in U.S. News & World Report’s latest rankings, clocking in at No. 50. 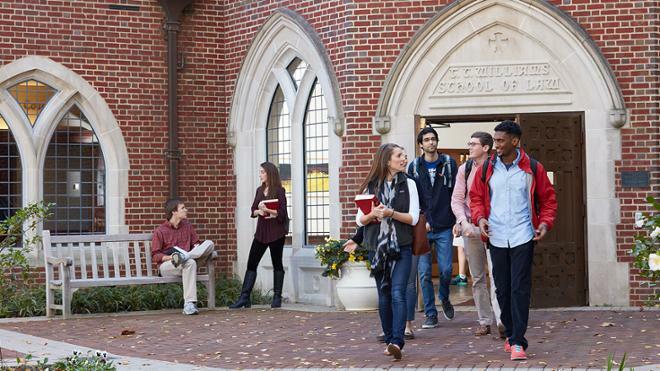 PreLaw Magazine ranked the school No. 18 for best law school buildings. In addition, Richmond Law ranks 28th for federal clerkships and 16th for state clerkships, according to Law.com’s analysis of ABA data. Our hometown got some love recently when Forbes named the city of Richmond as a “Coolest City to Visit” and Lonely Planet named it a “Top Destination” for 2018. Alex Sklut joined the law school staff in June as associate dean of students. Sklut comes to Richmond from the University of Georgia School of Law, where she had served as associate director of student affairs since 2015. “Dean Sklut brings with her a true passion for the job as well as a great wealth of skill, talent, and innovation,” said Wendy Perdue, dean. Courtney Curry in the law school’s advancement office was promoted to assistant dean for development following the retirement of Karen Thornton. Under Curry and Thornton’s leadership, the law school saw its highest year ever of giving.